The Owners of this family-run bottling company wanted to consolidate their operations and selected a site just outside Ranson, West Virginia. The site was convenient to a major highway and had railroad access as well. Even though the building was essentially a warehouse, they wanted it to have a distinctive and fun appearance. Helbing Lipp Recny Architects designed the 96,000 square foot facility using a pre-engineered metal building for economy of scale, but applied oversized curved forms around the façade, reflecting the appearance of soft drink cans. Visible from half a mile away, the rhythm of these shapes succeeds in giving the building a fun and attractive appearance. The curved forms become windows around the front of the building, at the second story administrative office area. At the entrance to the office area, a large bow-truss-framed covered entry was applied, with giant “soda cans” for columns. 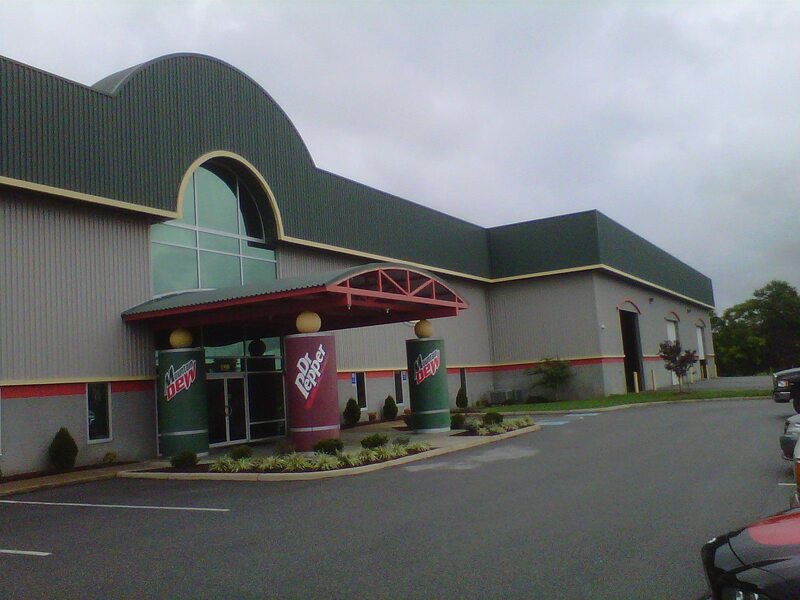 The colors for the entire facility match that of the Dr. Pepper and mountain Dew cans that are inside the building.